Here is a closeup of the beginning of the pattern to show the detail of the stitch pattern. A few changes and modifications I did make were to have 4 double crochet (DC) stitches at the beginning and end of each row. I am not sure why row 2 of the pattern has 5 DCs including the Ch-3 and then other rows have Ch-3 and 3 DCs making a total of 4 DCs. Also row 3 ends with just 3 DCs? I reached out to Shelly who wrote the pattern at her blog and also through Ravelry but I did not receive a response when I asked about this discrepancy or if I had a misunderstanding of the pattern directions. So I just changed the pattern to make it so all rows start and end with 4 DCs including the Ch-3 at the start of each row. Because of the extra stitch at the beginning of the first row 2, you would want to just chain 99 to start the pattern. This will allow you to have 4 DCs on either end of the rows which keep the pattern uniform in my opinion. Here is a closeup picture of the finished border. As you may see, the chain 3 spaces are stagger opposite each other from rows 1 and 3. I did work a row of single crochet stitches around evenly before I began border row 1 as the pattern was written. Therefore I have 5 rows of blue for my finished border. 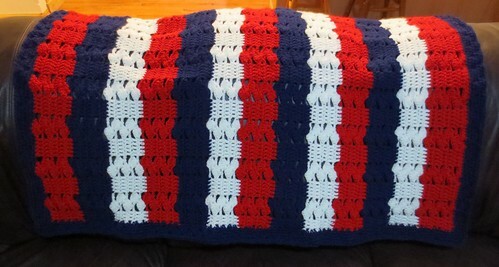 Finished size of my lapghan blanket is 32 inches wide by 42 inches long. 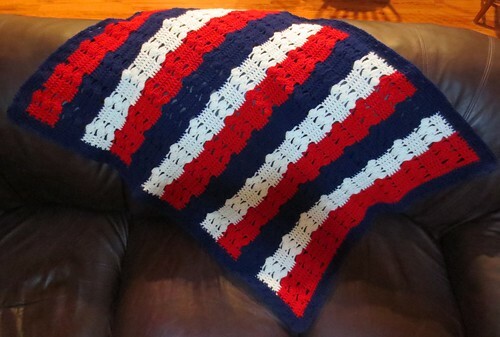 I love the stitch pattern and am very happy with the overall outcome of the blanket. 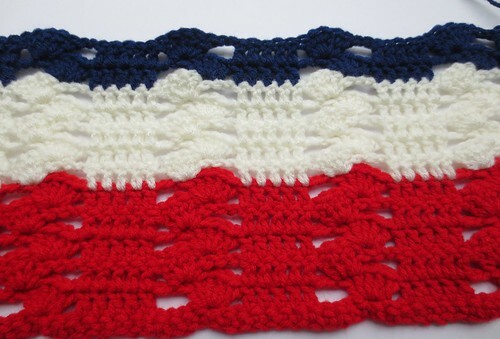 I definitely want to crochet another blanket using this attractive pattern. I just found your blog and I can’t wait to continue reading it. I wanted to find a way to use my daily newspaper bags and started searching. Thanks for all the wonderful ideas. I love this afghan by the way. Beautiful. I will be adding your blog to my list of blogs to follow on my own blog Cathies Craftworks. 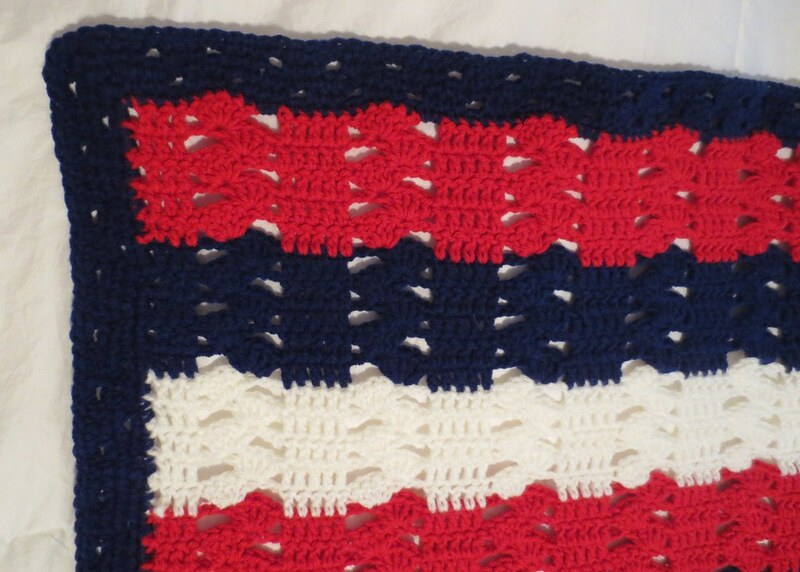 This article is so informative and patriotic crocheted lapghan blanket is so nice and comfortable i like this blanket so much thanks for sharing.